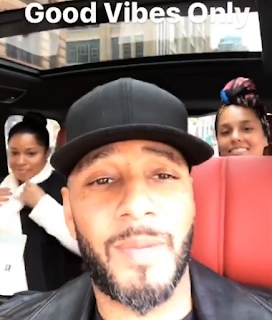 Fun Fact: Mashonda famously accused Alicia of breaking up her family by having an affair with Swizz [click here here here here and here if you missed that]. This is really great to see. I love seeing mature adults coming together for the sake of their children. He seems flirty without Mashonda. She should get him back just to prove a point to Alicia-who've incidentally looks a bit uncomfortable here. There's a difference in how you act when that man leaves you high and dry with his kids to care for vs. being a good provider to not only his kids but you as well. Mature adults? No mature man. Trust that he has given and is giving Mashonda her 40 acres and a mule for her pain and suffering. Everyone is "mature" because no one feels left out, but trust that Mashonda is not trusting their asses any further than she can throw them. I feel what you are saying at 6:31AM but it still seems a bit awkward. What would the convo be? Alicia - Swizz brought me flowers and we made love all night long. Mashonda - Did he hit from the back?...b/c I know that is his favorite position. Just too awkward for me. Well, we would never pal around if I was Mashonda, kids or not. I wouldn't speak to either of their assess if their lives depended on it. I see Alicia broke her resolution to go make UP free.I guess she knew mashonda will be seen with her she didn't wanna feel diminished. Nah. They're either on some sister wives ish, Mashonda and Alicia are hooking up, or Mashonda is just dumb. They can be civil for the kids' sake without being corny BFFs. Whatever it is, Swizz's ego is loving it. Did any of yall watch the LHHNY reunion recently? "SWIFT" is tryna look like the good family man to distract from that mess on there. That is all. Sister-wives maybe. If they are good for them. If it's legal for men to stick dicks in each others butts then polygamy should be legal too. Damn who cares carry on with your tawdry lives. Alicia hoping Mashonda will take him back. F that BS of them being "mature". Celebrities constantly trying to showcase how their more enlightened than regular folk. You can be mature but do you have to be all up in their car and go on vacations together? Just cause you have children don't mean you have to create a crazy situation. Their behavior is only masking their sister-wives status.